We use blue light for underwater fluorescence for the simple reason that it is better than ultraviolet light (black light) for this application. There is no one light that will make everything fluoresce, but if you want to choose a light to give you the most varied and vibrant fluorescence experience blue is the way to go. Why do we say this? Science plus experience. The following is a little history of how we came to this conclusion. When I (this is now Charlie Mazel, NIGHTSEA founder, speaking) first started thinking about and experimenting with underwater fluorescence I used ultraviolet light. Like just about everyone else I had a mental association between fluorescence and ultraviolet light, since that is what we commonly see used in museum displays, black light posters at parties, etc. I built my own underwater UV lights (like the one in the photo below) and modified underwater strobes to maximize their ultraviolet output. I was perfectly happy and used ultraviolet for years. I did a lot of night diving, saw a lot of fluorescence, and took a lot of great photographs. One of NIGHTSEA founder Charlie Mazel’s early home-made underwater ultraviolet lights. It changed my life. When I showed my fluorescence photos to a marine biologist I expected to be told exactly what I was seeing. It turned out instead that I had stumbled into a bit of a scientific hole – the existence of fluorescence in corals was known, but there had been very, very little research. One thing led to another and I ended up going back to school for a PhD in Marine Biology, specifically to conduct research on fluorescence in corals. As part of my research program I was collecting fluorescing corals in the field and bringing them back to the laboratory to measure their fluorescence properties. The main thing I measured was the exact distribution of wavelengths of light coming out (the emission spectrum). 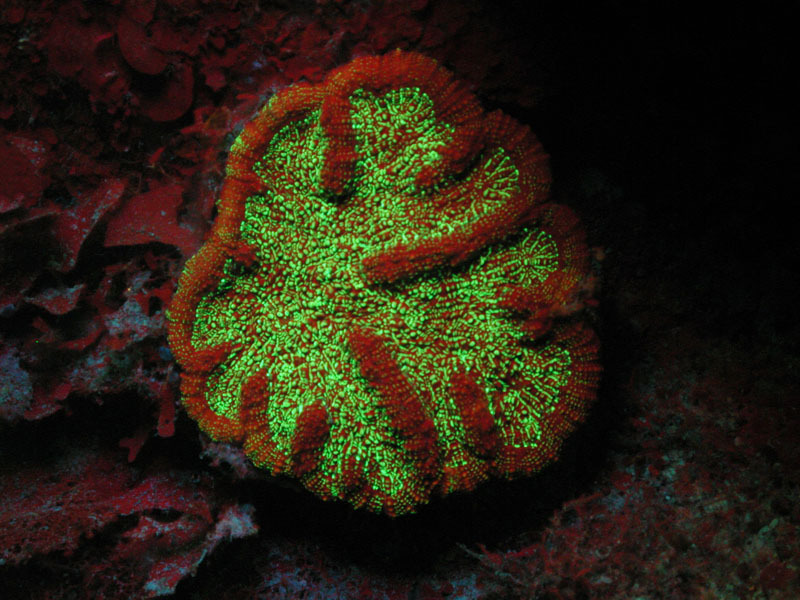 Just because the fluorescence of two corals looks green to our eyes, for example, does not mean that they are emitting exactly the same wavelengths, and the right instruments will let you measure this. Eventually I had access to a spectrofluorometer, an instrument that can measure the excitation spectrum. 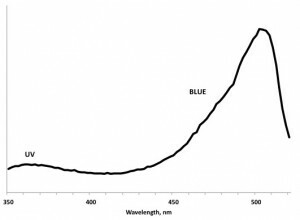 This is essentially a graph of the relative ability of different wavelengths of input light to cause something to fluoresce. The spectrofluorometer monitors one wavelength of output and sweeps through a range of excitation wavelengths with very fine resolution. When I started measuring excitation spectra I saw graphs like the one below. I knew that UV would make the coral fluoresce since that is how I located the specimen in the first place, and you can see a bump in the UV region in the plot. 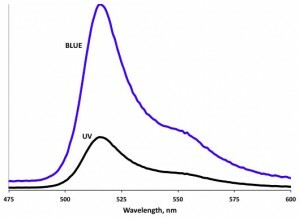 But according to the graph blue light should be more efficient at making the specimen fluoresce. Fluorescence excitation spectrum for a typical green- fluorescent coral. 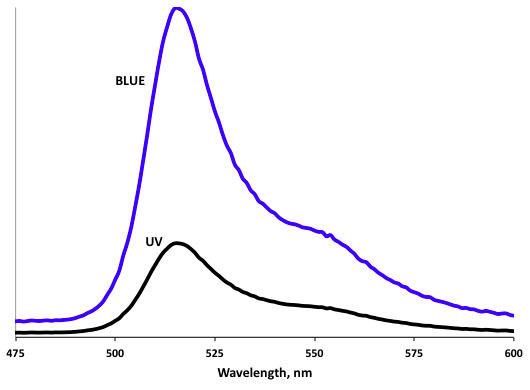 Note how much stronger the excitation is in the blue region compared to the UV. The plot below shows what we might expect if we illuminated the coral with equal energies of UV and blue light. 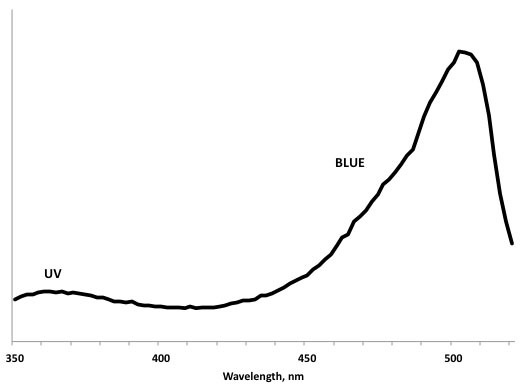 The emission spectrum would stay the same, but we would expect a stronger (brighter) response from blue than from UV. 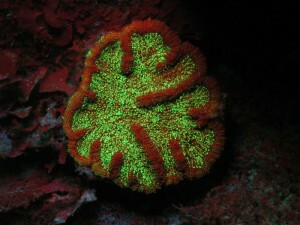 Representative fluorescence emission spectra for a coral illuminated with equal energies of blue and UV light. Once I saw these graphs I started experimenting with blue light, and it worked fine in the lab. I then made my first prototype underwater blue light and tested it against ultraviolet on a research trip in the Bahamas. 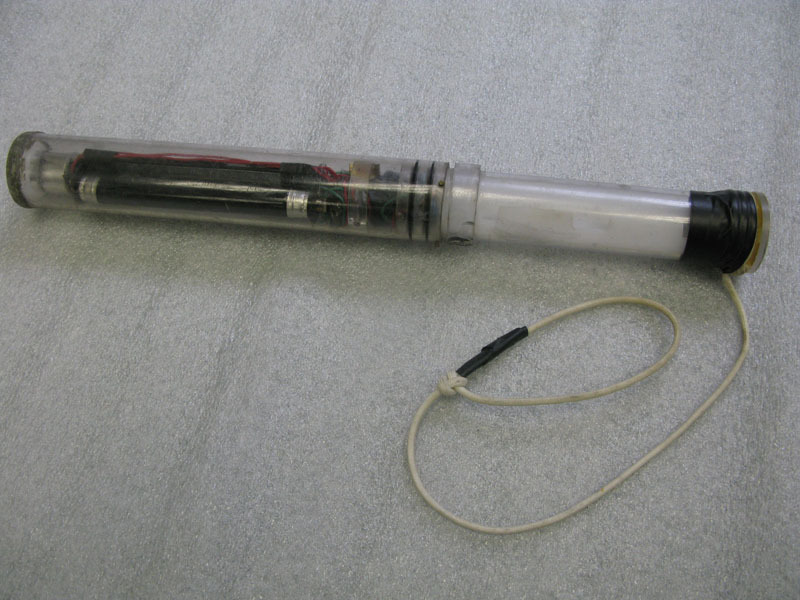 The prototype blue light was relatively weak, built around a low-powered filament bulb flashlight. The UV light I was testing it against was the most powerful one I had ever made. It was built around a 35W Phillips DUV discharge bulb, a relative of the high intensity bulbs used in some very expensive car headlights and designed to maximize UV output. I carried both on a night dive and alternated, first sweeping an area of reef with the ultraviolet then putting on the yellow filter visor and sweeping it again with blue light. No contest. The weak blue light beat the powerful UV light hands down. Yes, there are things that fluoresce under UV and don’t fluoresce under blue, but the reverse is far more true – more things were fluorescing, and more brightly, under the blue light. It was a clear choice for both general diving and science, and from then on I shifted entirely to blue light for underwater fluorescence exploration and photography. You do need to use a yellow barrier filter when looking for fluorescence or taking photographs with blue light. When you shine a bright light on something to make it fluoresce some of the excitation light is reflected back at you. Since you can’t see UV (that’s why it’s called ‘black light’) you don’t need a visor. (The visor is essentially built into your eyes – your lenses absorb the UV. This is why some people who have had artificial lenses installed to repair cataracts can see UV.) With blue light excitation the reflected blue light can overwhelm the fluorescence. You can dive without the visor (some do, although it is not recommended) and see many things fluorescing because they are quite bright. But when you add the yellow filter all the reflected blue light is blocked and you can see much much more fluorescence. For example, there is a weak deep red fluorescence from chlorophyll that is found in algae, including seaweeds and the dinoflagellates that are symbiotic with corals, as you can see in the image below. Without the filter you won’t see this. Wearing the NIGHTSEA yellow filter visor over your mask is a small price to pay for the superior performance of blue light.